When I read that Emiline, over at Sugar Plum, was going to be having a St. Paddy's Day Pub Crawl blogging event, I thought - oh yeah - that's right up my alley! Boozy dishes, what's not to like? Well, after making this dish, I really didn't want to post about it, I even found it hard to photograph - and anyone would think I had already been on the pub crawl after tasting it. The recipe, written by Irish chefs Paul and Jeanne Rankin, fitted the criteria and was swimming in Irish booze. Irish Coffee Tart. Sounds fantastic, even looks tasty. Unfortunately, the base of the tart was very heavy, difficult to cut properly and it tasted quite greasy. The middle layer was smooth, you couldn't taste the coffee - actually that didn't matter so much because the Irish whiskey came through quite well - usually on desserts like this you can't taste much alcohol. On the plus side, even though it was a bit too sweet, the topping had Baileys Irish Cream in it. I didn't add the gelatine - the veggies in my house wouldn't touch it if I had. Over all, I was rather disappointed. I am hoping that we will be near to the end of our pub crawl when we get to eat this, we'll be so plastered nobody will notice. I won't be giving up on Paul and Jeanne, I have a few more of their recipes to try, I'm sure there's a winner somewhere! If you want to see the recipe, you can find it here, and if you make it, I hope it turns out better than mine! ooh this tart looks gorgeous. Love the wave like effect u achieved with the icing. I would love a slice of that right now. Despite some of the problems you expressed with this recipe Nic it looks absolutely delicious. Nic, it does look wonderful, even if it's not the best tasting tart you've ever made. How is it that I haven't found your blog yet? It's so nice! This blogging world is big, isn't it? I think this is a great entry. It's really different than anything I've seen so far. I love the first photo, with the bottle in the background, really nice. Too bad the tart doesn't taste as good as it looks. I'm sure you'll find a way to make it better though! oohh boy, I would take a slice of that right now! Looks delicious!! Too bad that you didn't enjoy this tart. I do have to say that with all the alcohol in it I probably wouldn't have enjoyed it either. Great pictures though, as always! I'll bet this dessert is not as bad as you imagine. It looks good and is certainly a boozy contribution to the event. SKOL!!! Hmmn. Looks great to me, with or without the booze! Emiline - there are so many blogs out there... so little time, lol! Thanks for a great event. LyB, no, I couldn't make it any better - most of it was thrown away. Gretchen - I would gladly let you have it all! Marie - the alcohol was the saving grace of this tart. Valli - cheers to you too! Scott - thank you, and you are welcome to it!! It looks great, too bad you didn't care for the end results:( I love the green sprinkles! I'd be happy to any leftovers you don't want. Oh my goodness this looks scrumptious!!! All of those ingredients - and it must have taken you ages to make - and then the disappointment. Well, we've all been there. It's a shame when something is lovely to look at and then not great on taste. I do not drink, but I can bend the rules for this edible "drink". I t looks sooo yummee. That looks good! 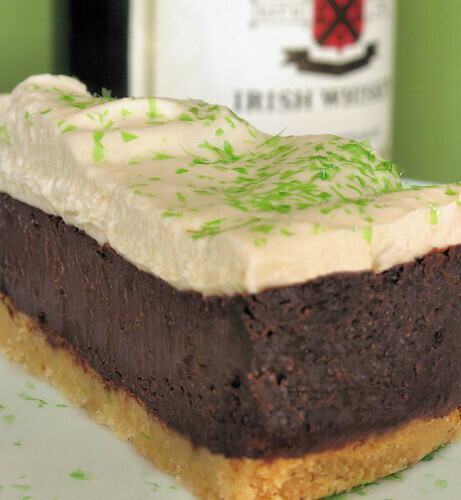 A nice boozy dessert for St. Paddys Day. I thought I'd died and gone to heaven when I first saw your pic!! Oh wow this is awesome and such a great entry for St. Paddys Day! Thanks for the great comments everyone, shame it went into the bin (trash). 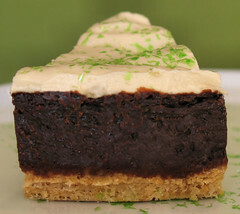 What a pity - it looks like a million bucks - kind of like Guinness made into a cake ;-) I have a question - what is the green stuff you've crumbled on topo?? Looks suspiciously like a South African favourite, Peppermint Crisp. And if it's not, it may be the perfect substitute for us homesick Saffers! Jeanne - the green stuff is flat coloured sugar sprinkles, nothing peppermint I'm afraid. There is a SA shop in one of the towns near to me, I will look to see if they have the Peppermint Crisp next time I go there, if I remember!